Patton’s IPLink WAN Gateway Routers are a complete all-in-one network access device which easily connects your IP/LAN to any T1/E1, X.21, or V.35 network interface. Combining ease-of-use with a full suite of LAN/WAN routing features, the IPLink routers provide selectable bridging or routing functionality along with advanced IP features such as NAT/NAPT, Firewall, and DHCP. A complete set of configurable ATM/FR/PPP/IP WAN protocols allow a wide range of choices when connecting branches via common WAN services. The IPLink Routers boast easy installation offering Console/VT-100, Telnet, and HTTP/SNMP management options. Patton’s new series of high-speed routers offer the versatility and reliability demanded for business-class applications at the most affordable price. 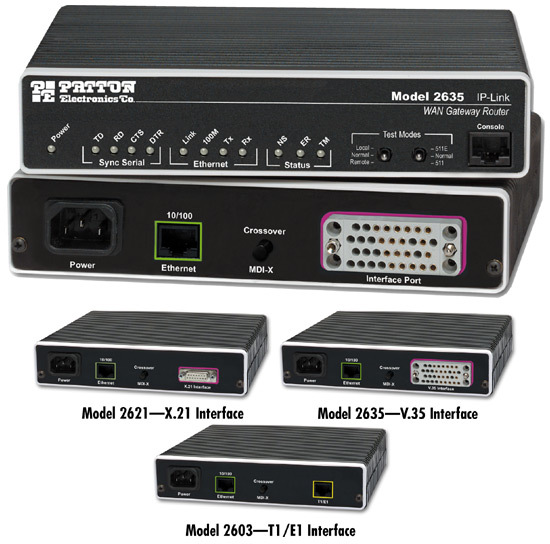 Patton’s IPLink Gateway routers deliver all the advanced features for secure, reliable, and high speed Internet data connections. They combine ease-of-use with powerful data routing to make shared Internet connectivity simple and easy. Power Supply: Internal universal 90–260 VAC input or 48 VDC input.